Nathaniel Legall was invited to present his undergraduate dissertation research at the prestigious Mammal Society Student Conference. A final year study of the pygmy shrew (Sorex minutus) by BSc Biosciences student Nathanial Legall was presented at the annual Mammal Society Student Conference in March. Weighing less than a 20 pence coin and measuring up to 6cm in length, the pygmy shrew is the UK's smallest mammal and protected under the Wildlife and Countryside Act – which makes it illegal to trap them without a licence from Natural England. It is common for the pygmy shrew to die if trapped but Nathaniel's study was the first to use a non-invasive method of collecting data, which avoids endangering the tiny creatures. "Usually you have to capture the shrew and take samples manually, but this is the first time that this has been done using a non-invasive method. As an island population it cannot afford fatalities, so it was important to carry out the study in this way," said Nathaniel. "This was my first time speaking at a conference and it was good fun. I don't consider myself to be the greatest speaker and I was really nervous, but to speak at a conference this early in my career is really good." Using Pocock and Jennings' (2006) 'hair tubes' method of placing bait in a plastic tube lined with sticky paper, Nathaniel was able to gather genetic materials for analysis without the need to trap the mammal as hairs from the shrews stick to the paper. The 21-year-old student from north-east London was then able to take these samples back to the biology laboratories at Middlesex, where he worked with Biology Course Leader Dr Steve Kett and lecturer Dr Martijn Timmermans to extract and sequence the DNA. Nathaniel compared his results against an internet database to establish genetic similarities with other pygmy shrews and assess whether the Lundy Island species is native to the island or a colony originally from the UK mainland. 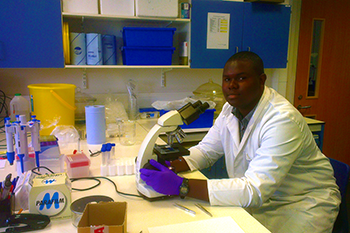 Samples were collected during an annual field trip to the island organised by the Departments of Psychology and Natural Sciences, and Nathaniel plans to return to the island again in June to collect more data and develop the project further. "Since the first trip we have extended the target region of DNA we're looking at, which means that we can have a more definite idea of where the shrews have come from," he said. 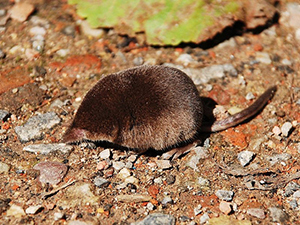 Photo of pygmy shrew by Polandeze, reproduced in original form under Creative Commons license.